CINCINNATI— The Cincinnati Symphony Orchestra (CSO) announced the details of an extensive, eleven-concert tour across Europe led by Music Director Louis Langrée over three weeks in August and September. The European tour comes on the heels of a hugely successful tour of Asia, in which Mr. Langrée conducted concerts at the Hong Kong Arts Festival, Beijing’s Poly Theatre and the Shanghai Oriental Art Center. The CSO most recently toured Europe in 2008. The Orchestra has been touring across the country and around the world for over a century, and in 1966 was the first orchestra to perform a world tour sponsored by the U.S. Department of State. Upon the tour’s conclusion, the CSO will return to a newly renovated home at Cincinnati’s Music Hall for the Hall’s Grand Opening concerts October 6-7. Music Hall recently underwent an extensive $135 million renovation and reopens to the public this fall. The tour will begin on August 25 as the CSO performs at Usher Hall in Edinburgh, Scotland as part of the prestigious Edinburgh International Festival, the Orchestra’s first appearance at the Festival. Mr. Langrée will conduct Bernstein’s Suite from On the Waterfront, Copland’s Lincoln Portrait (narrator to be announced at a later date) and Brahms’ Symphony No. 1. Both Bernstein and Copland developed robust relationships with the CSO, conducting the Orchestra on several occasions, and the CSO performed the world premiere of Lincoln Portrait in 1942 during the height of World War II. 2017 marks the 75th anniversary of the work’s premiere. Brahms’ musical oeuvre speaks to Cincinnati’s rich German heritage. On August 27, Mr. Langrée leads the CSO in its BBC Proms debut. Prom 58 at the renowned Royal Albert Hall in London will feature the aforementioned works by Bernstein and Copland, as well as Tchaikovsky’s Symphony No. 5. The Orchestra then travels to Spain for two performances at San Sebastian’s Kursaal Donostia and one in Santander at the Palacio de Festivales. On August 29 in San Sebastian, the Orchestra performs the aforementioned works by Bernstein, Copland and Tchaikovsky. On August 30, the CSO opens the program with John Adams’ Short Ride in a Fast Machine, followed by Bruch’s beloved Violin Concerto No. 1 featuring soloist Renaud Capuçon, a frequent collaborator of Mr. Langrée and the CSO. The program concludes with Dvořák’s Symphony No. 9, a work inspired by the composer’s time in the United States, but rich in the music of his homeland. The Santander program on August 31 consists of the works by John Adams and Bruch, as well as Brahms’ First Symphony. The next country on the itinerary is the Netherlands, where the CSO will perform on September 3 at the Muziekgebouw in Eindhoven. The program will include Bernstein’s Symphonic Suite from On the Waterfront, Bruch’s Violin Concerto No. 1 (again featuring Renaud Capuçon) and Brahms’ Symphony No. 1. The next day, the CSO travels to Utrecht for a performance at the Tivoli Vredenburg, performing the same program. On September 5, the Orchestra will perform at Queen Elisabeth Hall in Antwerp, Belgium. Bernstein’s Suite and Dvořák’s Symphony No. 9 bookend the program, with Gershwin’s An American in Paris in the middle. The CSO will perform its final three concerts in Paris at the Seine Musicale. 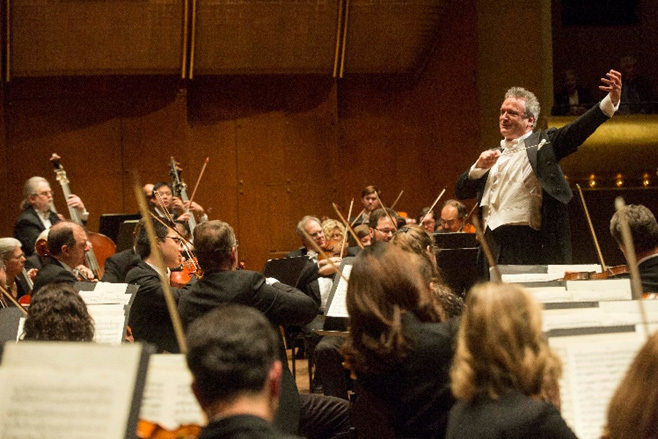 The first performance on September 8 will feature Bernstein’s Suite and Tchaikovsky’s Symphony No. 5. In addition, acclaimed French actor Lambert Wilson will narrate Copland’s Lincoln Portrait in French. On September 9, the Orchestra closes out its tour with a pair of concerts (one in the afternoon and a second in the evening) including Dvořák’s Symphony No. 9 and the official world premiere performance of a new critical edition of Gershwin’s An American in Paris. See details of this world premiere below. It will be a unique performance of Gershwin’s beloved work—a work by an American composer, inspired by Paris, performed in Paris by an American orchestra led by a French conductor. Members of the CSO will also be engaging in chamber music performances, masterclasses and other supplementary activities throughout the tour. Details will be announced at a later date. The performance of An American in Paris in Paris on September 9 will be the official world premiere of a new critical edition of the work. (The earlier performance in Belgium is a test performance.) The edition was prepared by musicologist Mark Clague, Ph.D., Director of the Gershwin Initiative at the University of Michigan, and it will be the first official premiere of any publication in the new George and Ira Gershwin Critical Edition (website). The University of Michigan’s research project is part of an educational partnership with the Gershwin families to create first-ever scholarly editions of the Gershwin brothers’ creative work while introducing new generations of students to their cultural achievements. The most significant update to the new edition of An American in Paris is the tuning of the taxi horns. The Gershwin Critical Edition proposes that the letters (A, B, C, D) on Gershwin’s original handwritten score refer to labels of the horns themselves, not their actual pitches. This edition uses A-flat, B-flat, high D and low A, as heard in a 1929 recording supervised by Gershwin himself (video). Gershwin’s original orchestration has been fully restored, featuring its evocation of a 1920’s jazz reed section in which three musicians perform on eight different saxophones, including a unique soprano saxophone trio. Gershwin’s original An American in Paris is more transparent and angular, more evocative of twentieth-century modernism and Roaring Twenties jazz. The CSO’s 2017 touring activity is made possible by Tom and Dee Stegman and the estate of Chuck Yeiser. These major underwriters are also joined by the following supporters for the European tour: Sheila and Chris Cole; Tom Garber and Family; David Herriman; Sandra and Stephen Joffe; Marilyn and Jack Osborn; Dianne and J. David Rosenberg; The Harold C. Schott Foundation/Francie and Tom Hiltz, Trustees; Randolph and Sallie Wadsworth. The Orchestra also receives critical annual support from the Ohio Arts Council, the Louise Dieterle Nippert Musical Arts Fund of the Greenacres Foundation, and the thousands of people who give generously to the ArtsWave Community Campaign. The Cincinnati Symphony Orchestra is a dynamic ensemble of some of the world’s finest musicians The sixth oldest symphony orchestra in the U.S. and the oldest orchestra in Ohio, the CSO has played a leading role in the cultural life of Greater Cincinnati and the Midwest since its founding in 1895. Louis Langrée began his tenure as the CSO’s 13th Music Director in the 2013-2014 season with a celebrated program The New York Times said “deftly combined nods to the orchestra’s history, the city’s musical life and new music.” Over the Orchestra’s 120-year history, it has also been led by Leopold Stokowski, Eugène Ysaÿe, Fritz Reiner, Eugene Goossens, Max Rudolf, Thomas Schippers, Jesús López-Cobos, and Paavo Järvi, among others. The CSO has built a reputation as one of the world’s foremost orchestras, determined for greatness and heralded as a place of experimentation. A champion of new music, the Orchestra has given American premieres of works by such composers as Debussy, Ravel, Mahler and Bartók and has commissioned works that have since become mainstays of the classical repertoire, including Copland’s Fanfare for the Common Man. The CSO was the first orchestra to be broadcast to a national radio audience (1921) and the third to record (1917). The Orchestra continues to commission and premiere new works from such composers as Philip Glass, Nico Muhly, David Lang, Caroline Shaw, André Previn, Thierry Escaich, Zhou Tian and more. The Orchestra is Cincinnati’s ambassador with over 10 million units sold, many of which have received Grammy awards and nominations. The CSO was the first American orchestra to make a world tour sponsored by the U.S. Department of State and continues to tour domestically and internationally, most recently to Asia in March 2017. The Orchestra also performs, records and tours as the Cincinnati Pops under the direction of John Morris Russell, and the CSO is the official orchestra for the Cincinnati May Festival, Cincinnati Opera and Cincinnati Ballet. The CSO is Cincinnati’s own and committed to bringing music education, in its many different forms, to as broad a public as possible, elevating the city’s vibrant cultural scene.